There are hundreds of questions and answers on various websites on Broken Pipe issue. The problem is essentially closed connection when a SSH session is not kept active by typing or running command. None of those websites can explain or give a universal easy fix. Readers report us of packet_write_wait: Connection to port 22: Broken pipe. 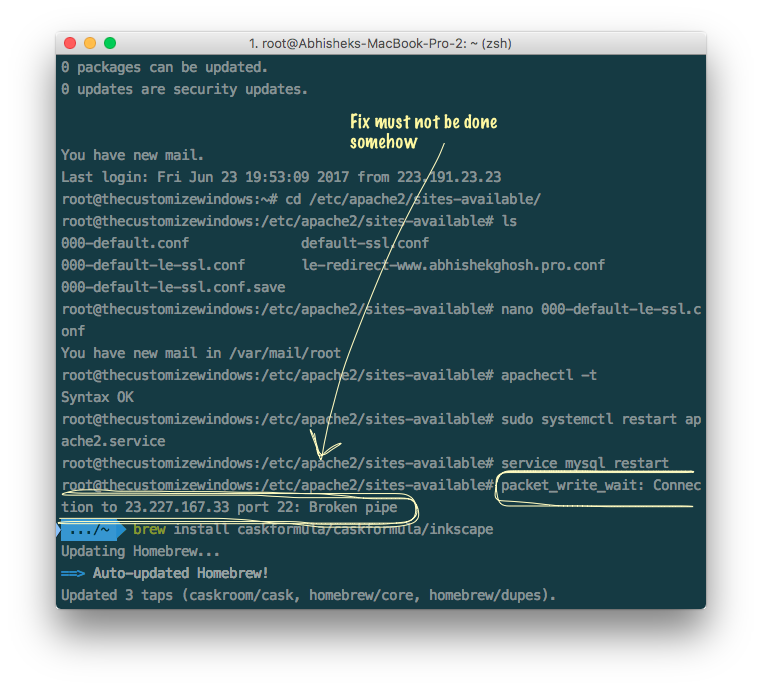 Here is how to fix write failed broken pipe on mac, gnu/linux. It is actually easy matter. ServerAliveInterval= is variable in minutes. 60 is one hour. username is something which you use to SSH like root by default. IP_ADDRESS is the IP address of your server. Why Various Q&A Site Fails To Fix Write Failed Broken Pipe & Why It Happens? is safe and secured way for your servers and Mac. This Article Has Been Shared 5179 Times! Mac OS X Original Theme for Ubuntu 12.04 : Will You Like It ? Mac OS X Original Theme for Ubuntu 12.04 will make Ubuntu look like Apple Mac OS X simply as the components are ported from Mac. But is it great to steal ? Text Editors for Mac OS X are required for more advanced functions than the default text editors like helpful syntax highlighting, macro and tabs. grep command for a program of UNIX and Unix like Operating System. It is used to search and filter. Historically, the name evolved from the command g / re / p.
Cite this article as: Abhishek Ghosh, "Fix Write Failed Broken Pipe (packet_write_wait: Connection to port 22: Broken pipe)," in The Customize Windows, June 26, 2017, April 21, 2019, https://thecustomizewindows.com/2017/06/fix-write-failed-broken-pipe-packet_write_wait-connection-port-22-broken-pipe/.